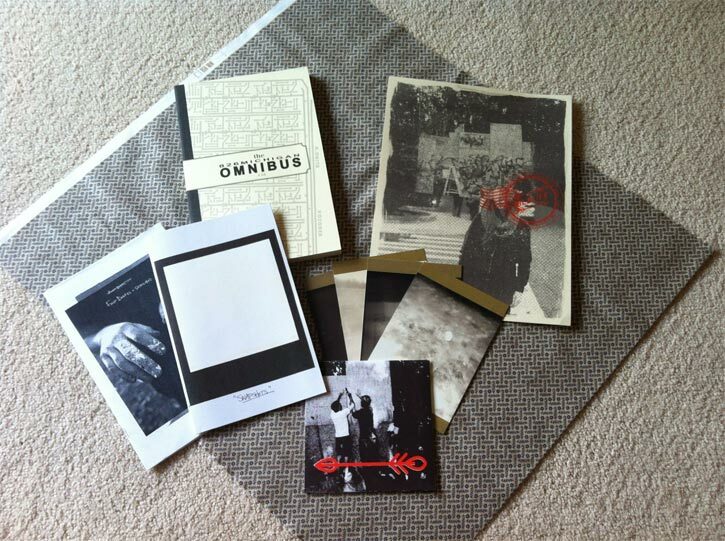 In April 2012, La Dispute announced their latest charity benefit project, Conversations, a packet consisting of a hand-assembled and multi-dimensional collection of items courtesy of La Dispute themselves, writers involved with 826michigan, and the band’s artist friends. All proceeds from Conversations benefit 826michigan, a branch of Dave Eggers’ literacy organization, 826 National. In this feature, we speak with vocalist Jordan Dreyer about their work with 826michigan and highlight all of the organizations they have worked with in-depth. As La Dispute continue to use their youth and energy to benefit the less fortunate, this on-going article will be updated to reflect their continued humanitarianism. Why did La Dispute choose to work with 826Michigan? I’ve known about 826 nationally and 826 San Francisco for some years now, kind of the obvious route, through reading Dave Eggers when I was in high school, and I’ve always been pretty attracted to the organization itself because I think it’s unique, in that it has a really creative approach to what it does — a very youth-oriented approach. It’s not like it’s just a program for creative youth; it is a program that is creative and youthful, I guess, kind of bizarrely and redundantly. So that was appealing to us, and trying to work with organizations that promote literacy has always been another important thing for us, so it kind of encapsulated multiple things we hold close to our hearts, and we also wanted to do something that was local, so we would see a more immediate impact. So rather than going through the national organization, we decided to work specifically with the one in Michigan. Was there one particular point in La Dispute’s career that you guys decided you were doing well enough or you were influential enough as a band that you wanted to start supporting organizations you cared about? Was it something you thought about from the beginning or something that just kind of popped up? The other thing that’s important with us is to work with organizations that seem to have a lot of transparency and have people we can actually meet and talk to, rather than helping faceless multi-million-dollar non-profits. To be on ground-level, I guess… it’s been pretty cool. Do you guys get any kind of a feedback loop, other than the profits you raise, regarding listeners who are encouraged to get involved because of your demonstrations? Here and there. We did the thing a Well House a couple years ago; we played a show in Grand Rapids, our hometown, over Christmas, and we invited a representative from the Board of Directors and also one of the people who was living in one of the houses to come to the show and hand out information. We actually had a couple people volunteer, or offer to volunteer – I don’t know what ever came of it – but they were interested enough that they want and talked and collected information and applied to volunteer. Here and there, you’ll get it, I think, but it’s interesting this time around [with the 826Michigan project]; it really depends where we are. Sometimes we’ll sell a lot of packets and get a lot of feedback, and other times, I don’t think people know they’re there. It does happen, which is cool. On December 25th, 2011, for a 24-hour period, the band offered up their entire discography for free, with all donations going towards the organization. All proceeds from their sales of Conversations (see above) will benefit the organization as well. – “Conversations” – an audio interview with Jordan about the stories and themes presented in Wildlife. The interview is also coupled with movements from Chad’s “Mixtapes” (which were ideas recorded on a dictaphone that would later shape some of the songs on Wildlife). Everything is open for interpretation by the listener, of course, but it does give a little more insight into the concept of the record. – “Snapshots” — a zine of polaroids I’ve taken on various tours and studio sessions surrounding Wildlife. – Screen printed poster designed by Mr. Adam Vass. – 4 postcards: a Departure, a Letter, a Poem, a Broken Jar. – a select few will also include our “First Drafts + Sketches” zine. There are only 150 of these packets, and when they’re gone, that’s it. $20 each. All proceeds go to 826michigan. On their Australian tour 2012, La Dispute collected donations for Headspace, the national organization that aids young people aged 12 to 25 who are suffering from mental health issues. 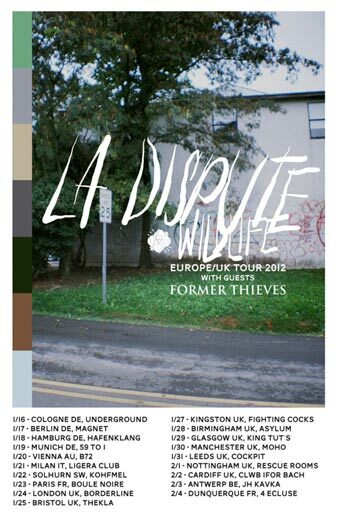 During the United Kingdom portion of their 2012 European tour, La Dispute gave all of their profits from sales to Teenage Cancer Trust, as well as plastered venues with posters to raise awareness about the organization. La Dispute’s Here, Hear series consisted of three spoken-word EPs released over the course of a year-and-a-half. With the release of the series’ third installment, Here, Hear III, the band offered the EPs for download on Bandcamp, in exchange for donations that would benefit Well House. Between December 24th, 2009 and January 27th, 2010, they raised $1755.44 for Well House 1.